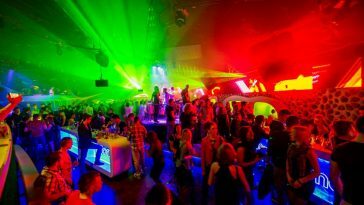 Non-stop nightlife activities await you here in Munich. 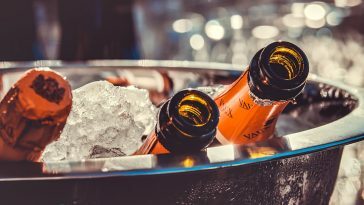 Check out our list! What’s not to love about Munich? 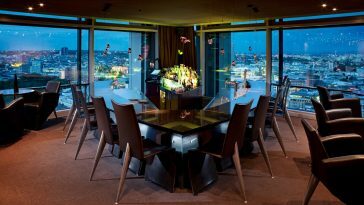 It’s a vibrant and stylish city offering the best clubbing and dining experiences in Europe. 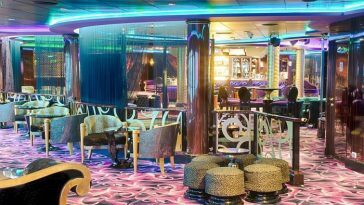 It provides a fantastic variety of entertainment and nightlife from century-old restaurants, to trendy clubs and chic bars. Munich is known around the world as the city that host the annual Oktoberfest, held every September to October. However, for the rest of the year, it remains a city full of joy and non-stop excitement. 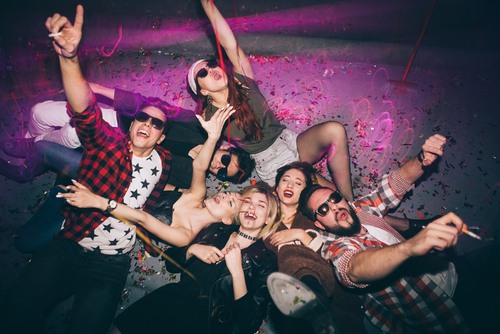 In this article, we’ve round up the best nightlife activities and tours in Munich you can’t experience elsewhere in other country. 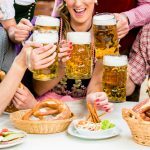 If this is your first time in Munich, then this three and half hour tour is the best way to be one of the locals and dig deeper into some famous Bavarian food and drink culture. 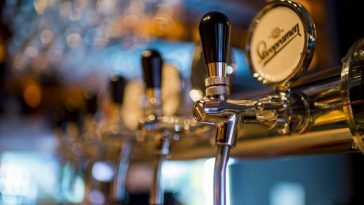 During this tour, you’ll get to roam around the famous beer gardens, beer halls, and meet new people. Here in Munich, beer and bike are great combination. 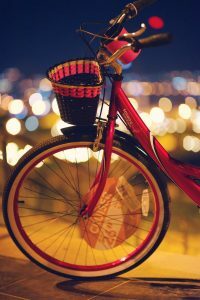 One can book this unique experience of traversing the city’s tourist spots and beer garden while riding a bike. During this tour – as you cycle with your local tour guide – he’ll give you a background of each cultural and historical spots in Munich. 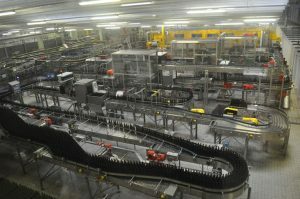 There will be several beer stops in this tour so expect to taste some fresh and Bavarian beer as you go along the way. 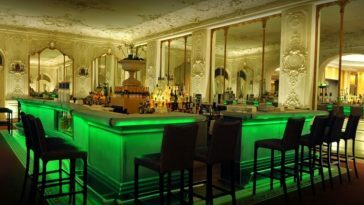 This is definitely one of the nightlife activities and tours in the city to look forward to. Check out more details and information about the Evening Munich Beer and Bike Tour at viator. One of the best things when traveling to different countries are the knowledge you get about its history and culture. 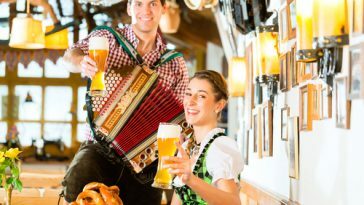 If you want to know more about the German beer history and dreaming of visiting the most unique spots in Munich, then this guided tour at Munich’s famous beer halls and breweries is one of the best nightlife activities and tours to book if you’re in the city. Your guide will show you the most famous and oldest breweries and will share you its history, and even lets you taste it. 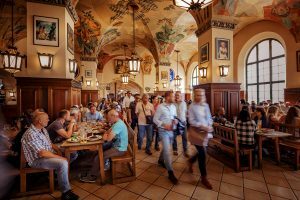 Like any other tour, you will find yourself at the famous Hofbräuhaus where you can enjoy nice beer and some famous Bavarian dishes with your group. 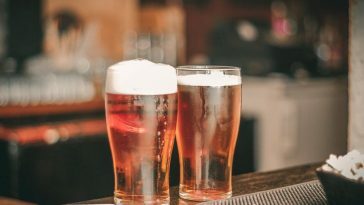 Want to combine the usual normal sightseeing tour with a beer tour? Then you better book this Brewery and Beer tour with the Express Hop-On Hop-Off Tour in your list of nightlife experiences. 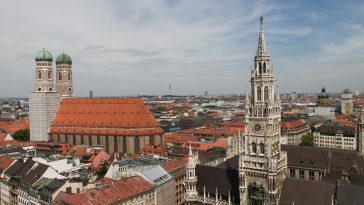 If you book this tour, you will find yourself in the possession of a pass for a hop-on hop-off bus tour through the nice city of Munich and will visit all famous sightseeing spots, like Marienplatz, Odeonsplatz, Max-Josephs-Platz, art galleries and many more. But your pass will even provide you the possibility to relax and enjoy a nice 3-hour brewery and beer tour. You will learn about the German’s history of beer and their way of brewing. Afterwards you can enjoy and come down from a nice tour with some samples of the brewery and some Bavarian food in the brewery. Book you experience here at viator. 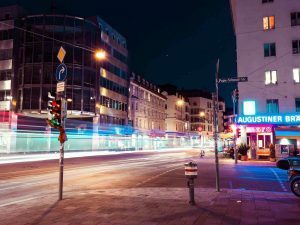 If you want to enjoy some of the best bars and nightlife spots in Munich, then headover at the famous Glockenbach — one of the perfect nightlife activities. This experience let you make the most out of your trip in the city. 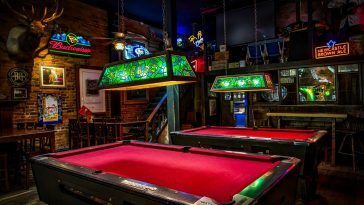 Here, you will meet a lot of new people and enjoy some of the best drinks through pub crawling. You can also visit some poetry slams live jazz music around the area. Get to view full information at getyourguide. 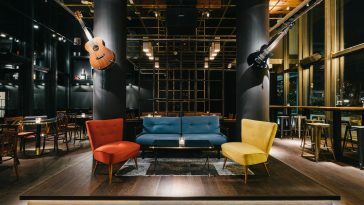 If you don’t want to wait in line to visit the famous Hard Rock Café in Munich, we suggest you book your Skip the Line: Hard Rock Cafe Munich to experience a hassle-free nightlife experience when you’re in the city. If you book this experience, you can just skip the line and directly move to your priority seating. After munching on their good food, drinks, and live entertainment, you can head over at the Rock Shop to check out the newest arrivals. 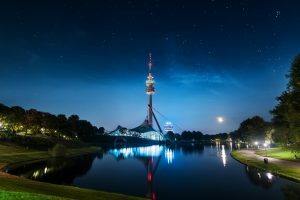 If you’re more of a nocturnal person, or you’re just done touring the city in daylight, book a Munich Night Tour with dinner at the Olympic Tower. When you’ve ascended at the tower, you can enjoy the illuminated Munich or see the sun as its sets on the city. 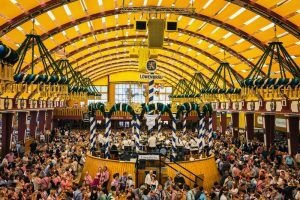 Like any other tour, you’ll get stop at Hofbräuhaus before the tour at the Olympic tower. 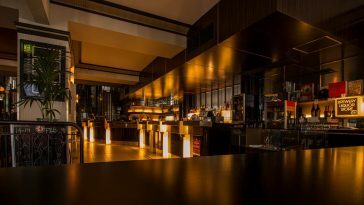 What most people don’t know is that the Olympic Tower houses 2 major attractions, the museum the Restaurant 181, where you can experience a culinary delight. 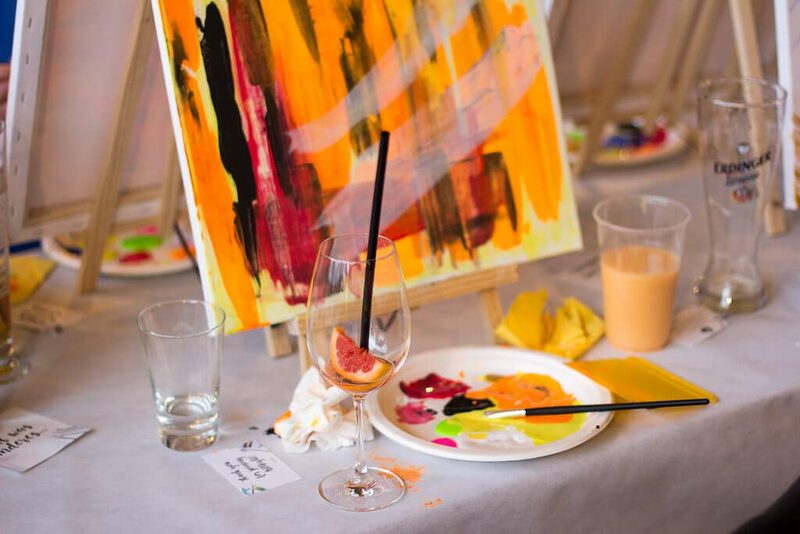 Bring out the Picasso in you and create your own artwork at ArtNight in Munich. 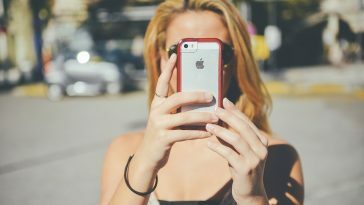 ArtNight is a mobile company wherein they invite people to create their own artwork under the guidance of an artist,. 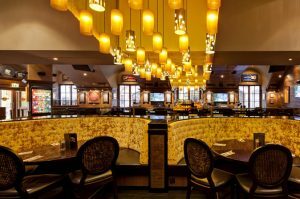 It is usually held in local bars and restaurants. 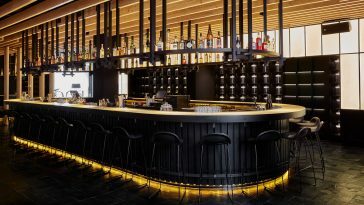 Food and drinks are available on the area. It doesn’t matter if you know how to paint or not, have it a go, and you’ll see how fun it is to do with your friends and family. To view their schedule in Munich, click here. 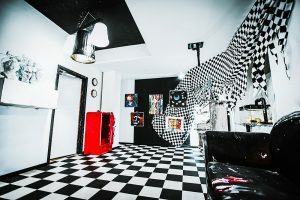 If you’re looking for a thrilling nightlife activities in Munich, try the Room Escape. Located at 2-6 Spieler. you can choose from themed-rooms such as The Haunted House, The Castle Dungeon, The Chinese Casket, The Tresor Cracker, Miserable and Misery, and more. This is definitely a perfect activity both for the young and old guests. 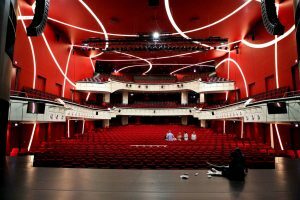 If you’re more of a laidback person and wanted to watch global hit shows and musical, then head over to Deutsche Theatre. 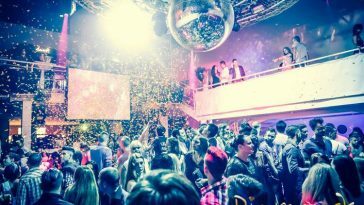 This is an example of a nighlife activities in Munich for locals and tourists who are into performing arts and live shows. 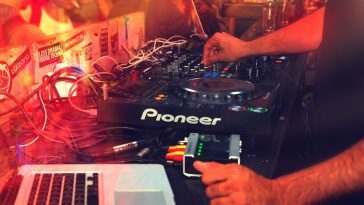 To check out the schedule of the upcoming shows, click here. 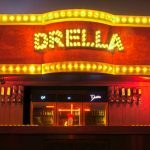 If you think we’ve missed a nightlife activity and tour in Munich which should be on this list, contact us! 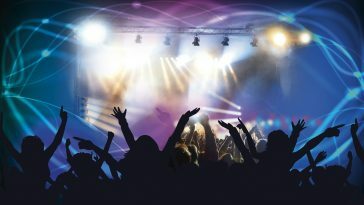 Are you looking for nightlife guide in other cities? Check out more cities here.